A robot is any automated machine that can perform work considered repetitive or infeasible for humans due to work conditions and nature of work. The control of a robot can be achieved in various ways. One of the most useful ways to automate a robot is with the use of hand gestures and movements. Such a robot has diverse applications various fields like medicine, industrial production, service, defense etc. Gone are the days when robots were simply found in the realm of science fiction. The world is increasing automation with speed and quality being sought after. Technology has been growing by such leaps and bounds that there are many restaurants and factories with more robots than humans! This trend is only expected to increase drastically. It is but a matter of time before robots are available not just for commercial use but also for domestic use everywhere as well. Companies like Google, Tesla, Amazon etc. have been investing a lot into robotics. Organizations looking to increase automation are trying to tap into the potential of robotics to achieve the same. 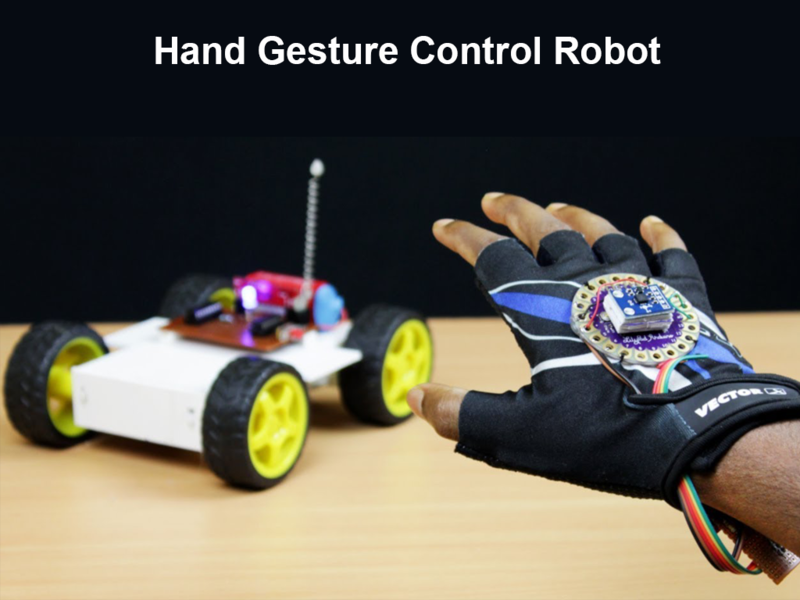 In this course, students will learn to build from scratch a simple robot which is automated based on gestures and hand movements. This course is suitable for all engineering students with a passion for robotics. All it takes is basic knowledge of coding and a thirst for knowledge. Doing the course early on opens the doors to a lot of opportunities including technical internships and the world of robotics which is filled with a lot of challenging and fun-filled competitions.